We would like to nominate our very special cavy, Kipper, because she is a real sweetheart and trooper! Kipper's namesake is the famous adorable British cartoon dog because their colorings match each other! Our Kipper is almost four years old but is a petite little girl, weighing approximately two pounds. Unfortunately, Kipper has spent much of her life in unstable health, i. e., recurrent bladder infections (even though her cage is cleaned twice a day); two procedures performed on an abdominal abscess; an inoperable bladder growth - through it all, Kipper has remained a fighter and is enjoying a high quality of life! Kipper is a lot of fun! She is a spoiled little princess - she purrs when her cheeks are rubbed and loves snuggling in laps! She gets impatient when any of our other cavies are getting attention and jumps up against the glass of her aquarium to get our attention! When it's time for veggies, her piercing whistle will wake up anyone who is asleep - she wants to be the first fed!! Kipper's favorite foods are fresh spinach, green leaf lettuce, hay and seed treats! Even though Kipper is eating well on her own currently, she is very petite so we supplement her diet twice daily with three cc of cranberry juice (to help prevent bladder infections), spinach & carrot baby food, yogurt and Oxbow's Critical Care. She looks forward to receiving her tasty supplements because she enjoys all the extra TLC! Kipper also enjoys [and begs for] "human" foods like Corn/Rice Chex and crackers (given as treats in moderation)! How spoiled is Miss Kipper? When she starts begging for a treat during our dinner time (or anytime! ), we jump up to feed the family Princess! Sometimes Kipper gets scared during loud thunderstorms - when picked up and gently rocked, she will immediately fall asleep while lying on her back! Being the recipients of Kipper's trust is deeply heartfelt and has created a very special bond between us! Kipper is a love bug! When kissed, she will turn around and immediately lick our faces like a puppy! Her return of affection is adorable!! It is impossible to put into words how much joy our precious Kipper has brought into our lives!!! 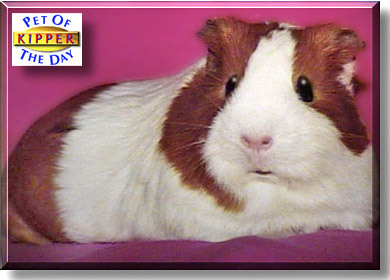 To see more fun photos of Kipper and other sweet cavies we've rescued, you can visit our (non-profit) web site Guinea Pigs R Fun.